The Days Ahead: Fed meets. Look for any change to their economic projections. One Minute Summary: Trade issues hung over stocks. The administration lined up China, which runs a $35bn monthly trade surplus with the U.S. It's quite a lot less if services are included but many businesses are annoyed at China’s freewheeling IP (Intellectual Property) transfers. The President asked for a $1bn a year reduction in the trade deficit but given that the deficit is more like $380bn and some 40% of the U.S. total, he probably meant $100bn. As for the new Chief Economic Advisor, Larry Kudlow, I’m hard pressed to remember anyone in that position who had much influence. But he seems like a decent enough fellow. Small company bank stocks rallied. The Senate passed the snappily titled Economic Growth, Regulatory Relief, and Consumer Protection Act, which raises the threshold for enhanced supervision by the Fed from a $50bn threshold to $250bn. So, that’s nice if you're a Key Corporate, Fifth Third or State Street. You now no longer have to provide a liquidation plan. In fact, only 12 of the 43 banks with over $50bn in assets will come under enhanced supervisory rules. All others get a pass. And yes, they all took TARP. Bonds rallied. Stocks were lower but small companies had their best two weeks of the year. They're now just ahead of large caps year-to-date. Europe recovered. It seems to be out of the trade crosshairs right now. Japan and Emerging Markets rallied some 2%. The dollar barely moved. 1. How’s the economy doing? Not as well as the administration thinks. The most important assumption of the tax package, and the one that presumes there won't be a trillion dollar deficit in the next few years, is that the economy will grow at 3%, or 50% faster than the post crisis level. If it doesn't, the whole Laffer curve, animal spirits, trickle down economics falls to the ground. Now some funny stuff has gone on with first quarter GDP growth for the last few years. It’s nearly always lower than the rest of the year. Why? Well, the economists are busy writing PhDs about it but it probably boils down to faulty seasonal adjustments. If retailers, for example, start holiday discounting earlier, then sales will be brought forward and there’ll be more of a New Year slump. Statisticians try to adjust but it’s a fiendishly difficult task. The February projections were for 5.5% growth. Since then, it has steadily fallen as manufacturing, trade, inflation and retail sales numbers have all come in below expectations. The latest number is for 1.9% and the two lines show the street and administration expectations. The street is revising its numbers now and we expect them to come in lower. Does it matter? Well, it’s the direction not the magnitude. So, yes, if growth is less than expected and consumers are not buying into the tax-cuts and higher take-home pay story, then the interest outlook changes. Treasuries rallied this week, as we would expect with lower growth. 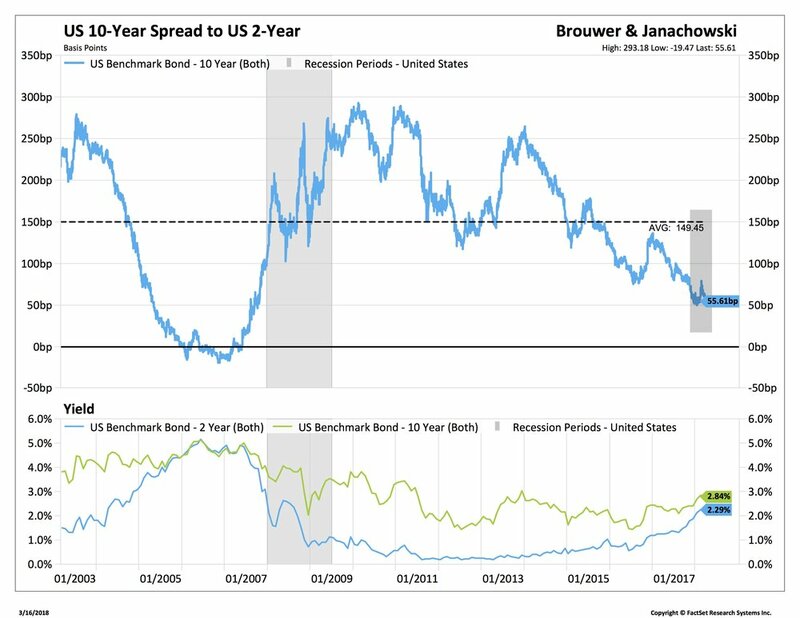 The peak on the 10-Year Treasury on February 21 at 2.94% now seems quite a way off and we feel very comfortable with our position in 7-10 year part of the curve. We like to talk around here about how not all ETFs are created equal. Some are great, the VOOs and SPYs of the world. Some are patently dopey, some dangerous. And some you really need to understand. One of those is the S&P 500 equivalent of the bond market, the Bloomberg Barclays Aggregate Bond Index (AGG). The S&P 500 is, mostly, the largest quoted companies in America sorted by size. The biggest component is Apple at $900bn and the smallest is Frontier Communications at $0.5bn (it’ll get bounced out at the next semi-annual rebalancing). Own the S&P 500 through something like Vanguard’s VOO and you’ll experience 3% turnover. But a bond index gets tricky. You start with all the bonds that meet your criteria of quality, maturity and size. Then you need to constrain it somehow or else a big corporate borrower like Ford will dominate your index. You then have to take bonds out that repay, or mature, or are downgraded, or if a new issue comes along. Then you ignore some bonds altogether like Treasury Inflation Bonds (TIPS), floating rate note bonds, or step-up bonds. This all gets busy and so the index rebalances every month. Own the AGG through something like iShares AGG and you’ll experience 250% turnover. So what? Well something interesting is about to happen. The AGG excludes Treasuries and MBS that are held by the Fed under the QE program. Fair enough. They're out of circulation so no need to count them. But the Fed is selling them and they're going back into the index. At the moment, the AGG has 37% of its assets in Treasuries. By most estimates, it's headed to 45%. We also know that Bond Index ETFs are growing. They have at least $1.0 trillion today and are expected to grow to $1.5 trillion in a few years. That's a lot of demand. Numbers are hard to come by but we think ETFs, as forced buyers, will buy some 30% of Treasury issues in the next few years. It’s one reason why we think there will be a smooth run up in rates. (H/T David Ader). Bottom Line: We'll see the new Fed at work. They'll be looking at this, which is the spread of 10-Year Treasuries to 2-Year Treasuries. The lower it gets, the more likely an economic slow down. It took another dip last week. No major changes to portfolios. Growth should come from International and Emerging Markets. We're lightening up on real estate and other rate sensitive stocks. We continue to like investments providing downside protection on the S&P 500.